A report has concluded any plans to harness the tidal power of the Solway Firth would be expensive and environmentally sensitive. The findings come from consultants hired to assess the feasibility of using the estuary for power generation. They said the scheme could generate 800 jobs during construction and attract 200,000 visitors a year. However, their report recommends more detailed studies to assess financial, technical and environmental effects. 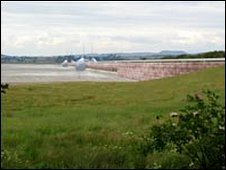 Early studies into a Solway barrage were carried out in the 1960s and revived four years ago by a Cumbrian-based businessman. He suggested that the ideal location was the line of an old railway viaduct between Bowness in Cumbria and Annan in Dumfriesshire. He believed that a new road link on top would make it a tourist attraction as well as a source of power. Scottish Enterprise and other agencies from both sides of the border funded a consultants' report which will be detailed on Thursday at a conference in Dumfries. They investigated various barrage and lagoon options in both the outer and inner Solway. Their preliminary conclusion is that significant energy reserves are theoretically available but cannot be captured without significant environmental impacts. Any way forward, they say, would have to balance technical, financial and environmental factors and significant additional feasibility work is required.